Updated on 3/6/2017. 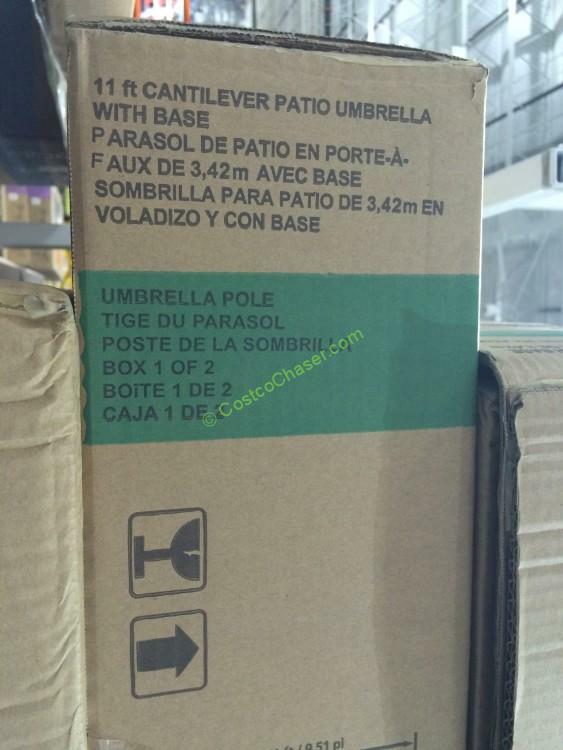 Proshade 11′ Parasol Cantilever Umbrella is come back to store now with a new Costco Item#1031593. The new price is $489.99, which is $10 cheaper than last year. Proshade 11′ Parasol Cantilever Umbrella with Sunbrella fabric seems well constructed and looks huge enough to provide a lot of cover. You can also get it online at Costco.com, but need to pay extra $100 for shipping and handling. Umbrella rotates 360 degrees on base and the new improved cranking mechanism allows it to be raised or lowered stably and easily. The base features fillable chambers to provide weight and stability by filling with sand or water for best results. Can you buy just box 1? I already have the base. 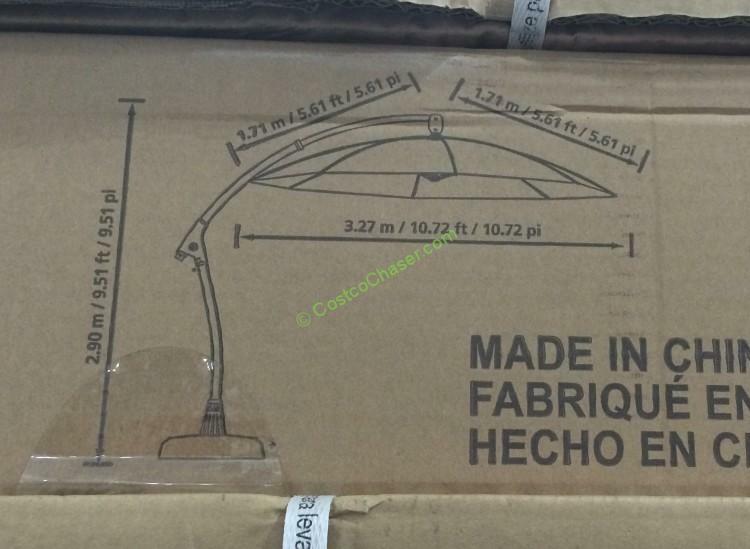 I have the proshade 11 feet costco umbrella, for the life of me I can not find the replacement caopy,and the instruction how to install the canopy! any help? We purhcased this unmbrella from Costco, less than 30 days ago. Yesterday would not close. The umbrella moves down about 12″, then goes back up again. The control cord (visible at the top) appears to have the black outer sheathing frayed back causing the issue. Dissapointed. One was blown over in a storm and one of the struts got bent; can one be purchased? Also, can covers be bought for these umbrellas? We have had two of these umbrellas for years and LOVE them! One of them was blown over in a storm and one of the “struts was bent. Can a replacement strut be ordered? We have lost the crank in a move. Where Dan we purchased replacement crank? Love the umbrella!!! Help! Just bought this umbrella used from a neighbor who is moving away. It was set up at her home so I know it works. Disassembled it, brought it home, now can’t get the standing tube into the base. I think it’s because the fixed ring is IN the hole in the base, so tight I can’t remove it. I believe it’s supposed to be inserted in the TOP of the standing tube, right? Any ideas on how I can get that fixed ring out of the hole in the base without breaking it? I need help. I just purchased the 11 ft cantilever umbrella from Costco. I got it all assembled however the umbrella keeps turning when the wind blows. Is there a way to lock it in position??? HELP!! Where can we get a replacement crank handle for the 11′ Cantilever Umbrella? Ours got lost and I couldn’t find one to replace it. Any help on how to replace the cord – ours snapped in the wind. I seem to have the opposite problem of everyone else. My 11′ pro shade umbrella is stuck in the upright position and does not want to close. When I try to close it the crank is so tight is impossible to move it even one click towards closing. Does anyone have any suggestions on how to get it closed. If anyone has a base and crank they’re looking to sell, I would love to buy it. I have an umbrella in great shape but we’ve lost the base and crank. It’s a bummer that these parts are so hard to track down. Well, I just stumbled on to this chat and am happy glad to see I am not alone when it comes to issues with my Costco umbrella! I am looking for a replacement cover and replacement gears for the crank. I looks like treasure garden sells the replacement gears but I’m not sure about the cover. I would like to find a local retailer (southern California) if possible. I would just return it to Costco, but I’ve had it over 2 years and wouldn’t feel right about it. Any ideas or suggestions on where to source the gears or cover would be appreciated! I did not secure my Proshade umbrella during a nasty storm and one of the arms snapped off. Can I order a complete new umbrella portion ? I need to get a replacement base for our ProShade cantilever patio umbrella (11 ft). I will be trying to call the customer service, but is there another source for this? We have this umbrella and our cord snapped. Any way to fix this? Such a waste if we can’t. Any help is much appreciated! No, not in Winnipeg. No longer in need of fixing anyway. Thanks! and Costco doesn’t stock them. I need one also. Any ideas where to get one. I have looked all over internet. I am unable to close the canopy, as when I turn the crank counter clockwise it just seems to turn the umbrella. I would like to close it as we have been having some strong winds recently. I also would like a user manual, if one is available so I can see what I am doing wrong. HELP! I have misplaced my crank handle and cannot find it. Where/how do I go about getting another one! Can’t seem to find any anywhere! Thanks for the help! I am wondering what you do with this umbrella in the winter time? I live in Central Illinois where it gets very cold for 2 to 3 months in the winter. I am especially concerned as I added some water to the base. I did not fill it. Do you think it would be ok to leave the umbrella outside in a cover or do you think the base will crack once the water freezes? Thank you. Does anyone know how to remove the umbrella canopy? I cannot figure it out and the instruction manual does not address this at all. I have this umbrella new in box still. Just do not have a base with it. Anyone interested in buying it? Or selling your base? Turns out a replacement base doesnt exist. Others are similiar but no guarantee that they will fit or work with it. I gave $150 for it. I live in Northern Ky. I have an umbrella that got hit with hail and besides the obvious holes in the fabric, the top (knuckle) that the ribs are connected to has one broken rib and cannot be repaired. Does the replacement umbrella canopy include the entire “knuckle” at the top? I believe this knuckle slides into the sleeve and is connected with a pin. We can’t figure out how to take the umbrella off the base for winter storage. Page 11 says to store it indoors but does just the top mechanism come out of the lower umbrella hole by lifting off the big joint? We removed the two screws but it won’t budge. I have this umbrella and love it. Unfortunately, it will not stay open by itself. Where can I by a replacement cord and get instructions for replacing it. WHERE CAN I GET A PARTS LIST TO ORDER A NEW BASE OR JUST THE STANDING TUBE? Looking for a cord replacement for the 11 foot parasol umbrella and instructions on how to replace the cord. The ribs snapped on my umbrella when it was left open during nasty weather so i salvaged the cloth, cord, crank, and the cover is still in its unopened package. If anyone is looking for these as replacement items email me at cebrillin@hotmail.com. My Proshade is a few months old. Worked perfectly until this morning. Now there is no ratchet clicking when I open the umbrella and it just closes when I let go of the crank. Is there a fix for this? If not is everyone just returning their umbrellas to Costco? Umbrella won’t stay open, as if locking mechanism is malfunctioning. Seems to be a common problem. Anyone find a solution our just take it back to Costco? I have the same problem as Jim (comment 15) and Alan (comment 27). Worked fine for a couple months, now won’t click when cranked to stay open. Any help is appreciated. The ratchet mechanism for moving the boom on my newly assembled umbrella doesn’t work with the boom being able to be moved by hand, only occasionally able to catch and hold. The handle doesn’t cause the ratchet to catch and move/support the boom. Any thoughts? Thanks. 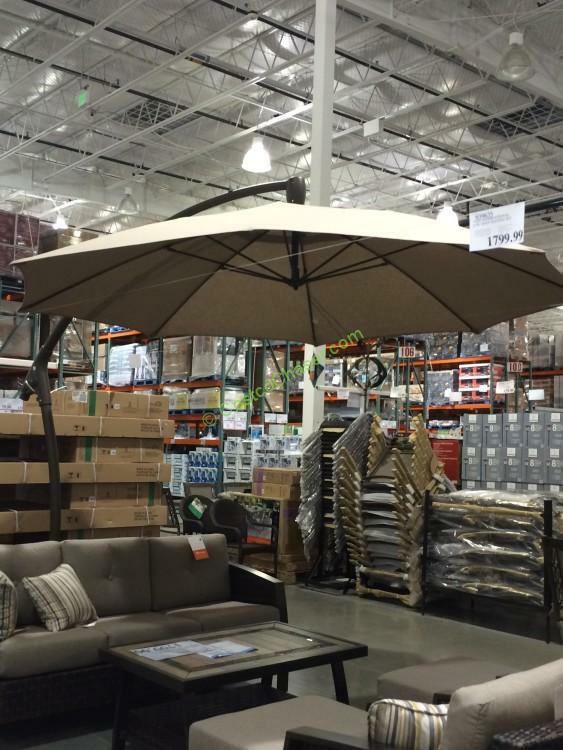 Purchased 11′ cantilever umbrella yesterday at Costco. Cannot get crank mechanism to stop when fully extending umbrella, as if stop lock mechanism is malfunctioning. Anything I can do inside crank housing, or top of umbrella, etc., or should I just return umbrella? Thanks for your reply. I need to certify that this umbrella meets CPA1-84 fire standards for combustibility. Can anyone lead me to the proper direction to prove this to the fire department? We have the same problem that Jim (comment 15) has. When the umbrella is fully cranked open, it will not lock in place and so is hanging with about 3inches if cord exposed. i have this umbrella and unfortunately it is completely worn out so i have to throw out the umbrella itself but i want to keep the base to reuse, does anyone know the dimensions of the pole to this umbrella or the dimensions to the hole in the base? i just need to get an idea when buying. i would by another but it is no longer sold online even though it was about a month ago. thanks. Will you please sell your crank to me? We have one. Where do you live? We have a crank, base and other parts available. We live in San Jose, CA. If interested please email me @ nrnelson67@gmail.com so we can make sure we are talking about the same umbrella, I can send pics, etc. I no longer have the base or crank available. Albert – I’d like to loosen the shaft covering with the “gears” so I can rotate the umbrella. Any suggestions or tools? My grip strength is insufficient. One of the difficulties with the base design for this umbrella and others like it is that the center of gravity for the unit is somewhere between the mast and the canopy. The force on the canopy side of the union nut is often so great that it will not turn, no matter what. The union nut is the plastic ring at the top of the base cone that tightens the compression spring against the mast. turning the umbrella requires you to loosen the union nut, turn the umbrella to its new direction, and then tighten the union nut again. NOTE: Do not turn the umbrella by simply pulling it around! Properly installed, it will not turn clockwise, and turning it counter clockwise will unscrew the base cone out of the base. It will at least loosen this joint which can allow vibrations from the wind blowing by to gradually wear away the plastic threads that hold the base together. Of course if this should happen to you, you may order replacement parts from me. The first part of turning the umbrella is to move the center of gravity closer to the middle of the base. Close the umbrella to do this. The closer it is to the mast the better. The union nut may need a little more help to turn. I usually work by myself. Stand over the umbrella using the same stance you might have if you were trying to pull a sapling out of the ground. I’m right handed so I put the mast behind my right shoulder with the closed canopy in front of me. Then I lean back a little to move the center of gravity even more over the middle of the base. This usually works and allows me to turn the union nut in my hands. Naturally, this operation as I have described it would be a lot easier with two people working together! Treasure Garden tells the buyer of its AG78 model, which has the same type of base as the Proshade 11′ umbrella, to put 200# of sand in it. A cubic foot of sand weighs approximately 100# so the base will hold 2 cubic feet of material. There are 7.48 gallons of water in a cubic foot which weighs 59.84#. Two cubic feet of water will weigh 119.68#. This will seem awfully technical to most people. It is something, though, that I have been curious about myself. The long and short of the whole question is that if you fill the base with water, you will be 80# short of the recommended weight for it. Sand or gravel should be the material you choose to put in your Proshade umbrella base. It seems as if most fill the base with sand. Does water work just as well? I purchased a floor display and have no instructions. Need to know how to fill the base and what is recommended (sand or water).? I prefer pea gravel because it is a little easier to handle than sand. They weigh about the same. I would not use water. It might leak without you knowing it and it is too light for the job. “A pint’s a pound the world around” is the rule of thumb for the weight of water. A gallon weighs eight pounds, and if the base could hold five gallons, the weight would only be 40 pounds. Put the bottom of the base where you want it, then put the center cone in just to keep your filling out of the middle hole. Fill the rest of the compartments and level the top. Take the cone out and put the top on. Then put the cone back in and tighten it in place. Insert the tightening ring and put the cone nut on loosely. This uses the same idea as a cap and ferrule gas line fitting. Now you’re ready to put the pole in the base. Fill with 200 pounds of “play sand” from home depot or Lowes. Pour evenly into all separate areas of base. Keep in mind that sand and gravel are sold by the cubic foot. A cubic foot of dry sand weighs approximately 100 lbs. It does no harm to buy 2 cu feet as you can return any unused bags to the store. It seems to me that hardware stores typically sell sand in 1/4 cu ft bags. Make sure that you do not get sand in the center chamber of the base. This is where the cone goes. You will have to use a vacuum cleaner to get the sand you can’t reach out of the bottom of this compartment. The base cone screws into threads molded in the bottom of the center. A clean connection is best. Read further to find a simple way to keep the center clear of sand. We assembled the umbrella with no problem. But we don’t understand where the rod for the cover is inserted. We do not see any pocket or anything in the cover. Can you help? Thanks! You mean the weather cover? The rod is simply a replacement for whatever stick you might poke inside the cover to lift the middle over the top of your umbrella while you stand on the ground. Thank you. It’s labeled “Umbrella Cover Support Rod” and the diagram indicates it goes inside the cover along the zipper. So you’re saying that’s just a rod to use to help put the cover on the umbrella? Great! My husband said, “That makes sense!” LOL We really appreciate the help. 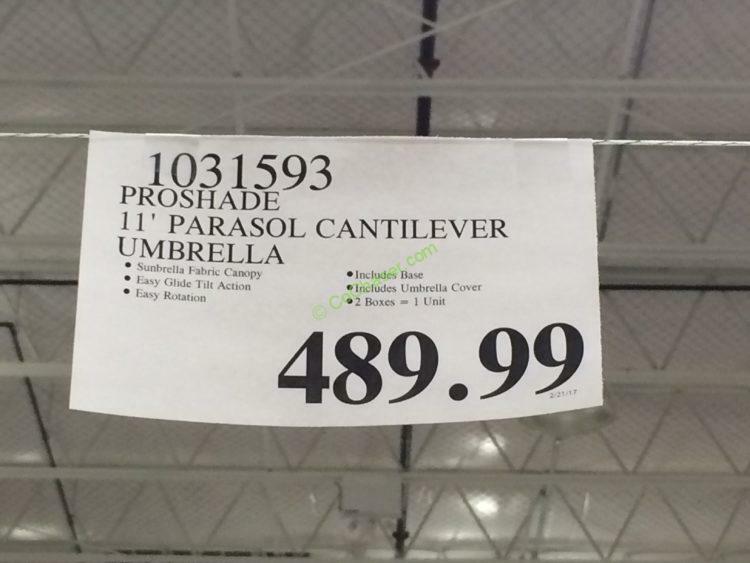 It appears costco has discontinued this umbrella. Any idea where i can find on? Even under a different brand name. Search for a Treasure Garden AG28 model umbrella. Outdoor furniture stores may carry it. Does this umbrella gets tilt? How much is the tilt? There are two holes in back of the boom where you might insert the crank handle. The upper one moves the boom in and out, and the bottom one opens the umbrella. Moving the boom back with the umbrella open will make it tilt. It will tilt only one way: Back toward you as you stand behind it. I haven’t measured the amount of tilt in degrees. As a practical limit, the umbrella tilts until the end of the middle rib hits the mast. I guess it will go back about two feet at the most judging from the top photo above. The umbrella will swivel in place as if the mast marks the center point of a circle. This will turn out to be little help if you want to tilt the umbrella to block the morning Sun and then tilt it again for the afternoon Sun over the same patio furniture arrangement. The Sun will be below the edge of your umbrella cover when it is low in the sky no matter what. It is very important for you to understand that cantilever umbrellas typically do not handle cross winds very well. One brand I am familiar with has a mechanism built in to allow it to tilt to the side, but this is unusual. Most cantilever umbrellas, including the one just mentioned, will break when the wind blows too hard from the side. Close your umbrella and, if necessary, tie it to the mast when you see your it shaking around in the wind. ProShade crank issues – So my 11 footer has worked well until yesterday. Only 2 yrs old. it usually clicks when i expand it/open it and stays open. Now when i crank it open, theres no clicking and the tension is gone and the umbrella wont stay open. Ever happen to anyone else? is there any fix other than buying another one? Ours just developed the same problem. Any resolution or progress James? When retracting my umbrella it collapses to about 75 percent then it starts to expand again. Can’t figure that one out. All I need to know is how the mechanics works and how to get to them, which I think a lot of people would like to know. I have the exact same problem. Opens 75% then starts closing. It’s now 5/1/2018, a couple years after you posted. Did you ever resolve? The take up reel moves a little to the right and left on the crankshaft when you crank the umbrella open and closed, respectively. I believe that the reel can get stuck in the leftmost (closed) position. You will not hear clicking as you open the umbrella when this happens. The first thing to try is to add enough force to the reel to make it move properly. Wrap a convenient rope or bungee cord, etc. around the cloth cover. This will lock the rib cage in the closed position. Now carefully turn the crank to open your umbrella. It might feel stuck at first. We want to feel the handle give a little and then stop again. Don’t overdo it! Back the handle off slightly, free the rib cage, and you should hear clicking again. You may have to repeat the procedure a few times to get a consistent result. Do you have any idea where I can get a crank for my Proshade 11′ Cantilever Umbrella?. I’m currently having to use a screwdriver. Can you help? I also am looking for a replacement crank. Any suggestions are greatly appreciated! Check the inside of the square hole in your umbrella to find out how big it is. 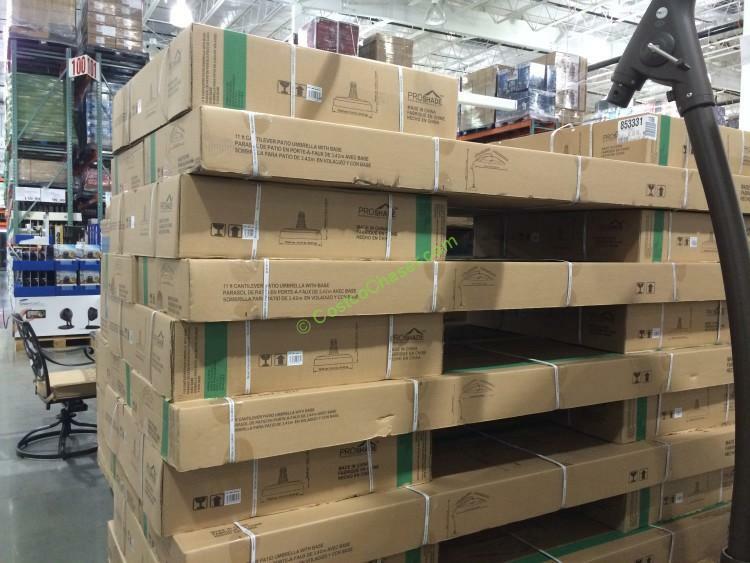 Two Costco stores in my area have sold out of them so I can’t measure it for myself. Be as accurate as you can. If the hole is even a little bit too small, the TG handle won’t fit. Thank you for your suggestion. We purchased the crank from Treasure Garden and it works perfectly! We have misplaced the crank for our Proshade umbrella. Can you advise how we can order a replacement? Can’t get my 11-foot round CPL908-AG to shift position on the center post. I can open & close, move it higher & lower but can’t shift it to better positions for maximum shade for various times of the day. Al – Movers “lost” the base to my Proshade 11′ Parasol Cantilever Umbrella. Looking to replace the base as economically as possible. Can you help? I can order a replacement base for you from Treasure Garden. Click on my name to find a way to contact me to place an order. Treasure Garden has limited the availability of its champagne color bases for the AG series this year. Their 2017 policy is that these parts must be included in a container order only. Container orders are limited to the highest volume dealers who estimate that they can sell the entire shipment before the end of the season (Fall). There may be a dealer somewhere in the US willing to speculate that champagne replacement parts used on both AG-28 and Proshade models might sell. Then again, there might not. I’m at a loss to understand this change in policy because it limits the availability of parts for Treasure Garden supplied umbrellas as well. I have just learned that Treasure Garden stopped making their AG-28 model in Champagne this year. I suspect that they want to separate their product from Costco’s. This makes sense from a business perspective. We open up our umbrella all the way so that the device in the center of the umbrella is snugly seated in the arm home, but immediately the handle begins to turn clockwise and the umbrella begins to drop (or if we take a handle out, just the thing inside does it). And then the umbrella sways back and forth in even the slightest breeze and keeps loosening so that pretty soon the device in the center of the umbrella that is supposed to engage with the arm is 3 or 4 inches below it. Is there a way to make this not come loose once it is snug or is this just the way they all or (in which case back it goes,as much of a hassle as that is)? Hi I was wondering if you found an answer to your crank problem question. Our umbrella is doing the same thing and won’t stay open. We’ve only had it for 2 months. Appreciate any info. I called the manufacturer. The receptionist said that they make a repair kit. She told me to expect an email by the end of this week with instructions on how to obtain it. The only requirement is that I send them a copy of my receipt. The only other alternative is to pack it up and return it to Costco. Mike who did you call? Hello Michael Elliot. I’m having the same problems with the center of the umbrella not fitting into the arm home and then slipping. Can you send me their phone no.? ours did the same thing. when it does this. fully close it and keep going the other way. it was turned the wrong way. it will click. It should go both ways. but only locks into place the correct way. Turn the crank in a forward (clockwise) direction to open your umbrella. The take up reel is designed to add friction to keep the umbrella open when you turn the crank clockwise, and to relieve the friction when you turn the crank counter-clockwise. Although you can open your umbrella by cranking it backward, it won’t stay open very long. Sometimes those of us in the repair business just have to wait for the right situation to see the obvious in a simple question. It isn’t all that unusual for a Proshade umbrella to be placed next to shrubbery or a wall. It isn’t always convenient for users to stand behind the umbrella to operate it so they stand in front of it instead. Here’s the rule of thumb to use: push the handle away from you at the top when the crank is on the right side of the pole. Push the handle away from you at the bottom when the crank is on the left side of the pole from where you are standing. The crank must always turn clockwise to open your umbrella, but it isn’t clear which way that is when you’re standing in front of the umbrella with the canopy opening behind you. One further note. Do extend the pole all the way out when you open the umbrella from the front. This is to make sure that there will be enough room for you to stand between the canopy and the pole as it opens. You can pull the pole back to make it tilt after it is fully open overhead. Albert – you are a proshade umbrella guru!! More than likely the light that is not included is a Treasure Garden Vega Umbrella Light. It snaps around the pole. A small knob located in the center of the bottom of the runner hub of your cantilever umbrella will unscrew to allow a post to drop down. This post is where you would attach the Vega light. The Vega light is a rechargeable LED unit that is very easy to use. It comes in two sizes. One has four clusters of LED lights and a larger unit has six clusters. My preference would be the larger unit for a cantilever umbrella. You may purchase a Vega light from me, or try your local outdoor furniture store to see if they carry it. I’d like to purchase a Treasure Garden Vega Umbrella Light with six light clusters. Can you point me in the right direction? 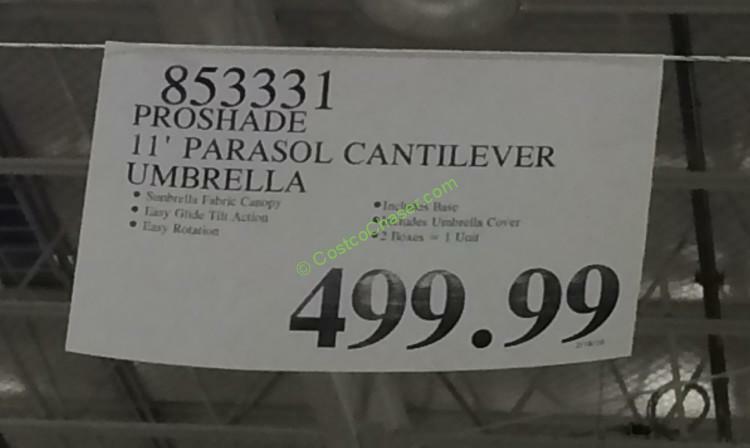 do you sell the lights that wrap around the proshade 11 ft cantilever patio umbrella from Costco? REPLACEMENT STEM? I am having the hardest time finding a retailer that will get a replacement stem for the base. (I only need that part – dogs had a go at mine this winter in the garage). One retailer asks 300$ just for the stem, no base, no bolt, no ring. I managed to get the part number from Treasure Garden (P-AGSTEM2-00) but they wont deal with customers directly. I ma Montreal, qc, Canada, but I wouldn’t mind at all ordering online. Click on my name to find a way to contact me. I can order this part for you. I don’t expect any trouble in shipping it from the US to Canada. Does the base have wheels? How do you move it? There are no wheels. The base is filled with 200 lbs of sand. When I first set ours up in was somewhat difficult to move around. My advice is to try to figure out where you are going to place it before you add the sand. Then have two strong guys to finalize the position. We ended up using a strap around the lowest part of the base to pull on. And sitting on the ground to get the proper towing angle. There is an easier way to move your umbrella once it is set up. First close the umbrella all the way and then tie it to the mast. This is to get the center of gravity as close to the middle of the base as possible. Unscrew the locking nut at the top of the base cone to free the mast then lift it off the base. The weight of the mast is off center and it will want to fall over to the cloth cover side. Be prepared for this. The mast is heavy enough to crash to the ground if it takes you by surprise. You will greatly appreciate a helper if someone is available. Now remove the base cone. Take the nut off and remove the tightening clutch. Put a pole or strong stick through the hole in the top of the base cone and unscrew it to take it out. Remove the base lid. Scoop out as much sand into a bucket or onto a tarp as you can to lighten the load. You may simply dump out the last of the sand once the base is light enough. Now move the base to its new location. Screw the base cone into the bottom section of the base temporarily. This is to keep the center section clean. The sand or gravel weight you use could foul the threads or prevent the base cone from going in all the way in your final installation. Shovel the sand back in the base and put it back together again. Keep in mind that the umbrella itself will be somewhat awkward to lift to return it into the base cone because the weight is off center. DO NOT TRY TO LIFT OR MOVE THE UMBRELLA BY PULLING ON THE MAST. You can easily break the base cone this way. I bought a proshade umbrella from Costco In June, while we were away in July a storm blew it and our table into the pool, now it doesn’t close, any help? For those asking about covers for your umbrellas, I would suggest the option of ordering this cover on Amazon for $25.99 that fits this Costco umbrella (see reviews from other Costco customers). The box for the umbrella and arm part is 100″ long – keep that in mind when transporting. The actual umbrella and arm parts are much shorter than 100″ so if you remove from the box, its a lot easier to fit in your car. I’d love to find a new cover as well. The umbrella is great, but the cover has fallen apart. Anyone found a place to buy a new cover? I’d hate for my $500 umbrella to get all weathered and moldy because new covers are not available. We have the same situation. If you look down into the top of the base where the poll goes in you will see white nylon teeth, an interior ring and and external ring. You will want to engage those teeth to keep the umbrella from turning in the wind. To engage the teeth, turn (tighten) the “nut” at the top of the base clockwise until the teeth intermesh. BTW, have you figured what wind speed is the maximum that the umbrella will tolerate without tipping over coming apart? We have pretty good breezes in the afternoon and I am nervous about leaving it up at the time of the day when we need it the most. Please note that cantilever umbrellas in general do not handle cross winds very well. You should close your umbrella and tie it back to the mast if the wind starts to whip it around. Other companies use the same design ideas built into the Proshade umbrella base. This shows that it is a proven design. 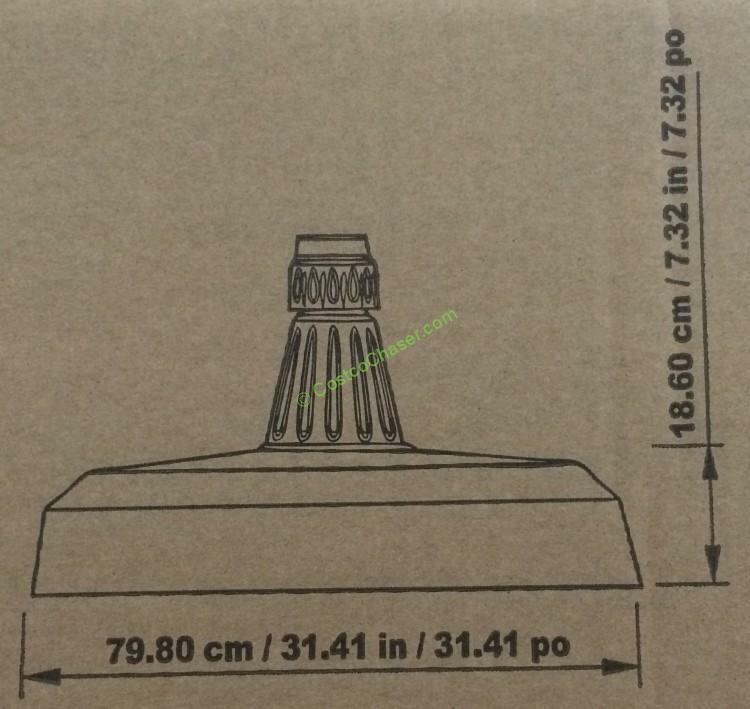 You may already know that the base cone has a small extension on the bottom with right hand threads molded into it. This is the standard for most of the nuts, bolts and screws we find everyday. Tom S rightly points out that the umbrella is free to turn when the union nut located at the top of the cone is loose. It may also turn when a strong wind blows past the open umbrella from right to left (counter-clockwise) when you stand next to the mast. This direction will put stress on all of the threaded joints in an umbrella. It may be strong enough to cause the weakest one to give. Once the threaded end of the base cone has come loose from the bottom pan of the base, the wind may turn it in either direction. This is a potentially dangerous situation as the umbrella might hit something nearby as it turns. Go out every once in a while to turn your umbrella clockwise to make sure that the base cone is tight. Most important of all, CLOSE YOUR UMBRELLA WHEN THE WIND COMES UP. Tie it to the mast. I know of no way of preventing a cross wind from unscrewing an open Proshade 11′ cantilever umbrella when the conditions are right. I need a new cover for this umbrella. If you make a great product in the umbrella and it last so long, why do you not make th protective cover to last or allow us to get a replacement for it. Now without the protective cover the umbrella itself will deteriorate, or is that your idea so we need to get a new one. I need to replace a new cord in my umbrella and the instruction too.. How obtain a new cord, from you. Thanks for you attention in this respect. Love our 11″ cantilever umbrella. Would love to get another cover for it to protect. Our has ripped after 5 years. Any ideas? The curved cover of the Proshade umbrella is difficult to duplicate. The unit appears to come from the Chinese factory that also produces Treasure Garden umbrellas, but the Costco version is sold direct. Treasure Garden does not have or offer any replacement parts for Proshade umbrellas at all. Costco does not import replacement parts either. The first thing to try is to return the umbrella to Costco. I have no idea whether or not Costco will accept it back due to its age. Costco’s return policy is very generous. 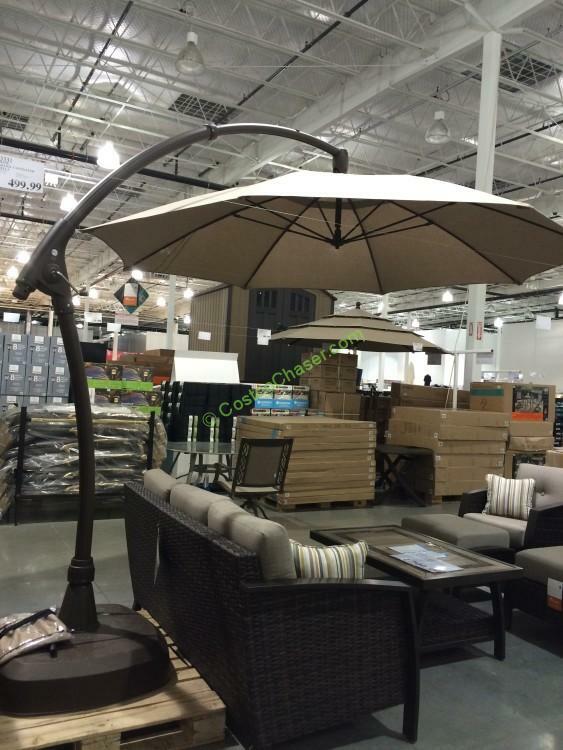 Costco might accept returns on the basis of customer satisfaction that a patio umbrella manufacturer would not. The next step I would recommend if Costco will not accept the return is for you to buy another umbrella from them. It will cost you as much to have a replacement cover custom made as it would to simply buy another umbrella. It appears to be the AG28 from Treasure Garden catalog. Fabric choices are detailed in the catalog. The fully opened AG28 has a straight rib and the Proshade has a curved rib. The AG28 rib and strut assembly is made out of aluminum and the pro shade rib assembly is fiberglass. The cover for the Proshade has to be cut in a special pattern to make the rib bend down when the umbrella is all the way open. 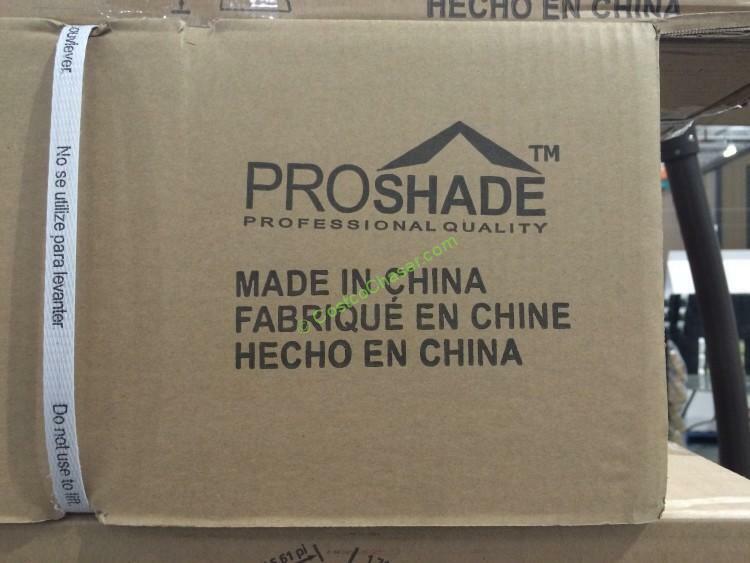 I have no doubt that both the AG28 and the Proshade model come from the same factory in China. They do appear to be different configurations of the same model umbrella. Treasure Garden disavows any connection to the Proshade brand, and will not sell replacement parts for it even when the parts might be compatible. I would love to buy a replacement cover Adam. Can you post to eBay or send me a link? I too have a brand new cover in its un-opened package that i would sell. Un-fortunately my umbrella didn’t much more than a year. Chris, do you still have the cantilever umbrella cover? If you do how much are you selling it for? My umbrella is about 5 years old, the cover tore last in last weeks wind storm. Looking for a replacement over only if anyone still has one or knows where to find one. It would be possible for you to replace the cord in your umbrella. The instructions are too involved to describe in detail here. Please contact me and I will be glad to help you. I have Proshade 11′ Parasol Cantilever Umbrella that needs replacement cord. where i order? any tips on install? Glen did you every find a replacement cord as I need one for my umbrella? The cord has broken in our umbrella too. Do you sell replacement cords? If not, do you know where I can get one? Can you send me the instructions on replacing the cord? I would like to replace my cord also. Do you have instructions? No, to my dismay. I even tried contacting other companies that make a similar product and they had no suggestions. If you find a solution please post it. Hello Albert, I’m looking for a replacement part for my proshade umbrella. Not sure of the proper name but it goes into the base and the arm attatches to it with the treaded nut. Looking for instructions to replace the cord. Any help would be appreciated .